B2B and B2C Marketing – What's the Difference? 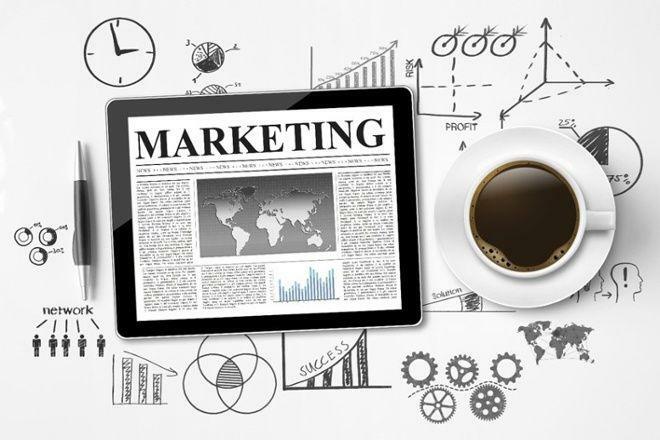 B2B and B2C Marketing: What is The Difference? Right off the bat, let’s clearly distinguish between B2B and B2C. Business to business (B2B) is mainly for those organizations who sell their products or services to other businesses. B2C, otherwise known as business to consumer organizations, are associated with the engagement and sales of their products or services to the end-consumer, who is someone who has no interest in reselling a product. Let’s explore the differences now, beginning with what typically describes B2B. B2B focuses on the logic of the product or service. The buying process tends to be driven less by emotions and more by logic, data and return on investment. Granted, this isn`t to say that certain B2C situations cannot be described in this way either. For example: Consumers who fall into the traditional “Economic and Cognitive” classicifation make calculated, rational decisions when buying higher priced products such as cars for instance. But many end-users are still buying passively and emotionally in the B2C market, even when it comes to expensive products. Consists of longer purchase cycles and decision-making processes that require more consideration. There are more stakeholders involved, thus you will most likely need to speak to several decision-makers. It`s important that you identify the key decision-maker, B2B sales require a significant investment in terms of time, to build solid trustworthy business relations with prospective buyers. Typically build longer term relationships than consumers do. Not only does it take more time to build trust, it can also become extremely challenging and expensive from a logistical standpoint to change suppliers etc. Especially for a large company. Need to understand the organizational buyers and how they operate within the business, what their roles are and where they need help. Should focus on what their product or service does, and how it can solve a problem that a potential customer may have with their business such as saving them time, resources or money. Generally, has fewer leads or prospective customers compared to B2C. The advantage is that the leads can be more accurately detailed and the sales pitch can be better optimized. By nurturing leads, digital marketing companies can present marketing qualified leads to businesses. Focuses on the benefits that a customer will gain from a product or service. Decisions are usually more emotional and non-rational. Consumers also like convenience, consequently increasing demand for a variety of distribution channels. Buying cycles are often shorter and quicker. Consumers have access to online shopping where they can buy something within a matter of minutes for instance. Consumers generally don`t like lengthy and interruptive marketing messages. The benefits of the product or service need to be easy to understand and concise. They also generally don`t have much interest in building long-term relations with businesses, especially for those who sell lower cost, highly competitive retail purchases such as food items. Focus on a target market using the marketing strategies such as the 7 p`s of traditional marketing which are product, promotion, price, place, people, processes and physical evidence. They concentrate their efforts on the results and benefits that their product or service will give their customers. 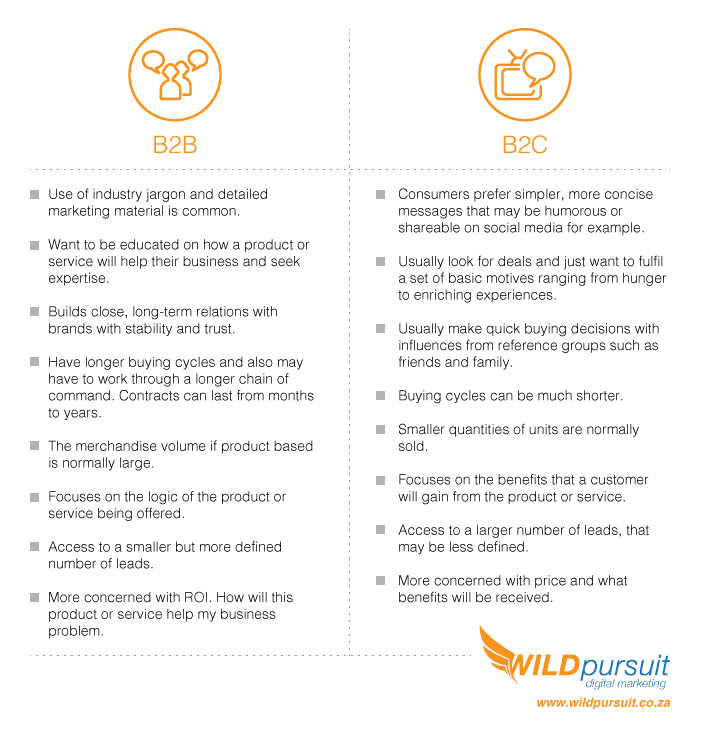 Let`s summarize the differences between B2B and B2C in our table below. You may be familiar with some or all of these points. Perhaps you have owned either type of business before, or even both. Regardless though of which business model you fall under, finding and determining your customer’s problems and solving their problems, is fundamental. So is building a strong connection.